Last edited by ilan; 04-18-2019 at 12:22 AM. Technicalities aside, however, the moon appears full to the eye for a few days. That’s because at the vicinity of full moon, the moon remains more or less opposite the sun for a day or two. 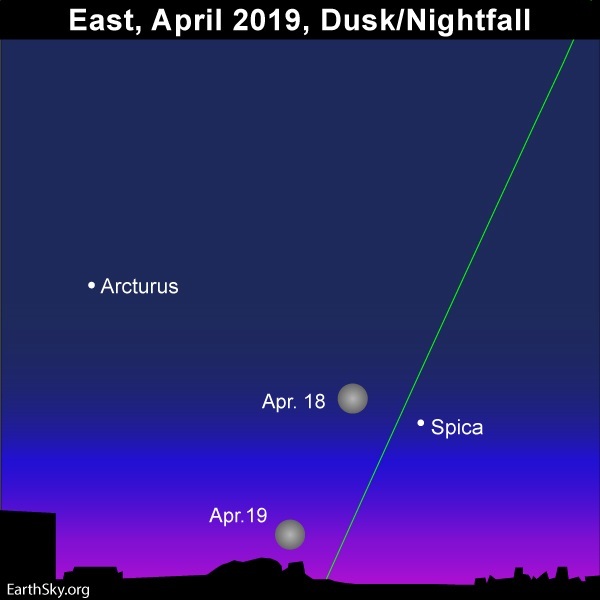 From around the world, expect to see a full-looking moon lighting up the nighttime from dusk until dawn tonight (April 18) and tomorrow night (April 19). Illustration shows extremely active, tiny star. On August 13, 2017, the Next Generation Transit Survey (NGTS) telescope spotted an intense solar flare from a tiny star barely bigger than Jupiter. But despite this star’s diminutive size, the flare gave off as much energy as 80 billion megatons of TNT. That’s 10 times as powerful as the strongest flare ever observed on our own Sun. It’s also the coolest star ever observed to give off such a hot flare, and the spectacular outburst is teaching astronomers the power of small stars. The tiny star bears the unwieldly name ULAS J224940.13-011236.9 and sits 250 light-years from Earth. In fact, classified as an L dwarf, it only barely qualifies as a star. “Any lower in mass and it would definitely be a brown dwarf,” said James Jackman, lead author of the discovery paper, in a press release. Brown dwarfs are sub-stars, too big to count as a planet, but too small to sustain the nuclear fusion in their cores that defines a star. Most telescopes, including NGTS, can’t even see dim little ULAS J2249−0112 during normal times. But the flare lit up the star clearly in the data, boosting it to 10,000 times its normal brightness. Jackman and his team published their findings April 17 in the Monthly Notices of the Royal Astronomical Society Letters. Because flares last only a few minutes – this one was visible for 9.5 minutes – it takes luck or a special instrument like NGTS, which looks at wide patches of the sky over quick time intervals, to spot such phenomena. X2.0-class solar flare erupt off our own sun in 2014. Astronomers have spied powerful flares from tiny stars before, but they are rare. In general, smaller stars like this one have fewer, less powerful flares than larger dwarf stars. ULAS J2249−0112 is just the second L-dwarf flare ever seen from the ground and the sixth L-dwarf to be seen flaring at all, and this flare is the brightest yet seen in an ultra-cool star. Astronomers weren’t sure until now that such small, cool stars had enough energy in their chromospheres, or outer layers, to support such powerful flares. But the find shows that even tiny stars can pack quite the punch. Last edited by ilan; 04-20-2019 at 01:15 PM. The moon is just a few days past full on the nights of April 21 and 22. Meanwhile, the Lyrid meteor shower is expected to put forth its greatest number of meteors during the predawn hours on April 22 and especially April 23. If you’re a veteran meteor-watcher, you’re already shaking your fist at the moon. Its glare will drown out all but the brightest Lyrids. However, the moon offers its own delights, sweeping past Jupiter – the largest planet in our solar system and second-brightest planet in our skies – on these mornings. Also, you can look for the bright star Vega, which nearly marks the radiant point of the Lyrid meteor shower. Both Jupiter and Vega should have no trouble overcoming the moon-drenched skies. Find them, enjoy them … and maybe you’ll spot a meteor, too! 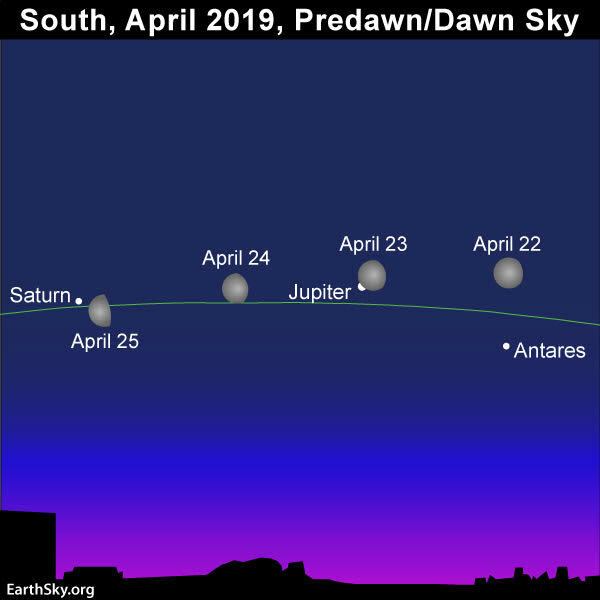 By the mornings of April 24 and 25, the moon will have passed Jupiter to appear near Saturn. The greatest number of Lyrid meteors usually falls in the few hours before dawn. That’s when the radiant point – near the star Vega in the constellation Lyra – is highest in the sky. For that reason, that’s when you’re likely to see the most meteors, albeit, this year, in the light of the moon. A view of the iconic Omega Centauri globular cluster. Omega Centauri (NGC 5139, or Omega Cen for short) is unusually brilliant, massive, and huge: 10 million stars squeeze into a sphere about 150 light-years wide. What most puzzles astronomers, though, is that its stars come in at least three distinct populations, suggesting the cluster came together over billions of years instead of all at once. Astronomers have long thought this peculiar globular might be something else altogether: the remains of a galaxy that came too close to the Milky Way. Torn apart by our galaxy’s gravity, its stars would have streamed into the halo and looped around the galaxy, leaving a small cluster-like core behind. Now, Rodrigo Ibata (University of Strasbourg, France) and colleagues report new evidence for this theory in Nature Astronomy: the long-sought detection of a stellar stream belonging to Omega Cen. Last edited by ilan; Today at 12:20 PM.